Reaching your specific audience means you have to market your website’s product or service. And many forms of marketing cost money as you’ve probably heard, “It takes money to make money.” Although this is true for many businesses, we live in a unique time where social media and other forms of communication exist online. Right now, today, you have instant and direct access to over 3 billion people.. That’s around 40% of the world’s population. In the world today, online, you have a direct line of communication with every single person who has access to the internet. You can reach them through social media, through online tools and applications, through email, Skype, and other means of direct communication. But, most importantly, you are able to reach these people with a website as your vehicle. 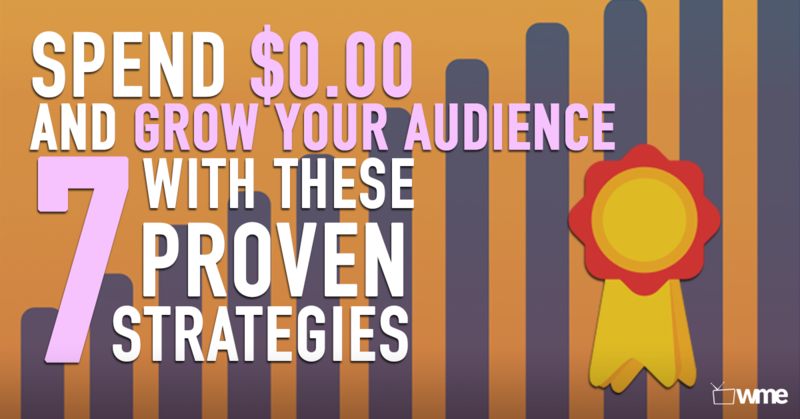 Here are 7 proven strategies to reach your targeted audience and ideal customers without spending a dime! Understand your audience and ideal customer and have a strong presence where they already are. Your audience already exists within certain communities online. They prefer Pinterest to Facebook, Blogging Forums over Instagram or email over networking events. Many huge companies today started out of garages and spread their brand through hustling by going door to door. The advantage we have today over many large companies that began 20 years ago is that we have access to 3 billion people without even changing out of our PJs! Check out some of these places where your audience is already voicing their problems that your product or service can solve. To reach even more people than the ones in your immediate circle of influence, you need others to share your content to each of their own circles of influence. If you really want to scale your reach, you’ll need an army advocating for you. How do you do this? There are a few ways where you can start. 1. Try offering an incentive for sharing about your company or content. Dropbox offered their customers 500MB of free storage space for referring a friend to sign up. Many cafes and restaurants offer a discount on a customer’s order in exchange for a share on Facebook or Twitter or for those who tag themselves and their friends at their location. The tool Trackr also enables this function upon checkout. 3. Build your community interaction by facilitating quizzes, polls, photo contests, or giveaways. Encourage others to use a certain hashtag in order to qualify for their entry into your giveaway. If you don’t have the money to incentivize a free iPad, for example, offer the prize as a featured spotlight profile of the winner’s website or endorse their product or service as a highlight for your entire community to see. You never know where your audience may prefer to consume content. Even though you can identify them as a 30 year old female with 2 kids and a $80,000 annual income, you never know if they’re all over Snapchat because her teenage kids are and they’re wanting to try it out. If you have the time and ability to devote at least some valuable attention to a certain social channel, jump on it and start delivering your content! However, make sure that you’re delivering your content in a way that respects the native channel. A meme that kills on Reddit or Facebook may not over index on Pinterest or Slideshare. Use the same message, but deliver it in a way that the audience on that platform would appreciate. This will take some serious organization and coordination, but will enable you to reach an even larger audience. You are able to ride the wave of other bloggers or YouTube channels, for example, which are more established than you are and are able to give you some exposure. Reach out to them and offer your products or service in exchange for a review or shoutout in their next post or video. You may ask for PR, influencer testimonials, and backlinks to your site. By building these relationships with other well-established influencers can gain you massive amounts of exposure to their entire audience if they are willing to share. Another great way to gain exposure is to continue to ride the wave of other influencers by working for free! Yes, you heard me right. By working for free, you have the ability to reach a massive audience like you never could have before. When it comes down to it you’re really investing in yourself in the long run. You also may have the ability to give a soft pitch for your product in order to provide an added benefit to that audience. You may want to grow your audience to reach higher numbers, but at the end of the day, it’s really about the quality of your audience rather than the quantity. I’d rather have 100 super fans who are actively engaged with every piece of content shared over 1,000 somewhat interested fans who never show up and never hustle with you on your climb! Your current network has been with you from the beginning and may give you the most honest feedback out of anyone. Reach out to everyone you know personally and see if they’re interested in trying out your product or service. They can also help engage with your content and create some real momentum behind each post. Go door to door. Seriously! Go door to door, go to networking events, trade shows, industry events, universities, concerts, farmers markets, etc. Show up in person and demonstrate how your product works or hand out flyers or put up posters at local businesses. Call event promoters and product promoters in your area and offer 10 of your new skateboards for them to try out. Building an audience is going to take some work, but if you’re willing to hustle and you are intentional and smart about your efforts, you’ll make it. Building your reach will take some serious effort and coordination, but with these 7 strategies you’ll start to get there without needing to spend a dime! Meet your audience where they already are and speak to their needs exactly how they prefer to hear it. Identify with influencers and channels that allow for similar audiences who trust the voice of the influencer backing your business. This will resonate much deeper because you took the time to know them and speak to their preferences. You’ll find that with your hard work, you’ll find that your audience will grow further than ever before! If you’re looking for a super simple way to get started online by setting up your website, you’ve got to check out all of our video tutorials on this blog! If When you like what you see, you have got to check out our entire collection of in-depth tutorials and strategies for proven ways to build your business online at WebsitesMadeEasy.tv. If you’re looking for ways to create your own new content, check out our post on 6 content marketing strategies and how to rank for any keyword. Also check out our 15 Best Content Curation Tools, Sofware, and Sites Every Blogger Needs article to help give you the direction for finding top performing articles and posts in your industry right now. Use these next articles as a guide to identify other influencers in your industry and emulate their quality while adding your own unique approach. Do you have any strategies of your own for growing your audience with little to no marketing budget? We’d love to hear your ideas below! Absolutely! We’re glad we could make your day! And be sure to keep checking back for more!